Each holiday season, a staff of 120 extremely talented horticulturists design and construct a breath-taking scenery sculpted almost entirely from trees, plants, flowers, and seeds in the botanical garden at the Bellagio Conservatory. The 14,000-square-foot floral fairyland is especially exceptional during the winter months with added bridges, gazebos, and water features to bring extra holiday wonder and cheer. The botanical garden is absolutely something to experience in person. Even better, this attraction is free, so you’ll have more to spend on special holiday gifts! A water park might not be the first place that comes to mind when searching for holiday activities to enjoy with the family. In this case, you can leave the swim suits at home because Cowabunga Bay transforms into Las Vegas Christmas Town – a winter wonderland right in the middle of our desert oasis. With over 2 million shining lights, a Polar Express Train experience, and their Mistletoe Ice Rink, you’ll forget all about the 115-degree weather we’re used to when visiting Cowabunga Bay in the summer. You and the family will also enjoy a 100-foot snow hill, bounce houses, a 40-foot dancing tree, and a visit to Santa and his reindeer in his cozy cottage. That’s still not all! You’ll also get the opportunity to have a “snowball” fight in Frosty’s Ball Pit and help Rudolph save Christmas by defeating the Abominable Snowman and the Grinch in a paint shootout! Located just outside Ethel M. Chocolate Factory is one of Las Vegas’s premier holiday attractions to visit. 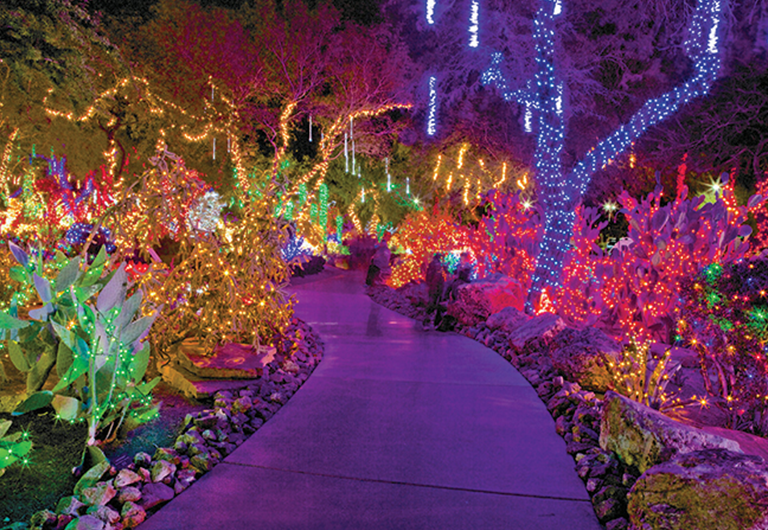 The three-acre Cactus Garden Holiday Lights feature more than half a million lights draped over beautiful cacti and desert foliage. On weekend evenings, you can find Santa enjoying the sights while listening to local choirs perform your favorite holiday songs. The garden is free to attend and while you’re there, you can stop by the chocolate factory to pick up some of Ethel M.’s delicious creations! This is the 25th-annual celebration of holiday lights, so it’s sure to be a special spectacle this Christmas in Las Vegas. Fairly new to our Las Vegas holiday scene is Holiday at The Park located near the T-Mobile Arena. The Park will be decked out with beautiful lights, festive ornaments, icicle lights, crystal blooms, and an 80-foot Christmas tree. With plenty of dining and shopping options, The Park is the perfect place to bustle around for all your holiday shopping. Every Christmas, the Cosmopolitan transforms its Boulevard Pool into an ice rink with more than 4,200 square feet of real ice to glide over. The cost of the ice rink admission includes all-day skating access and the cost of skate rentals; however, entry into the area is completely free! You’ll find toasty fire pits with lots of seating, a menu with comfort food, hot chocolate, and a variety of warm cocktails to choose from. Catch a holiday-themed double feature and watch a peaceful snowfall scheduled every 30 minutes. If you and your family prefer to stay warm and toasty during the winter months, then grab some hot cocoas to-go, snuggle up in the car with your softest blankets, and make your way to the Glittering Lights at Las Vegas Motor Speedway. There you’ll find a 2.5-mile-long lighted holiday paradise that you can drive through without ever having to leave your vehicle. With over 500 animated displays and 4 million twinkling lights decorating your way, you can set your radio to 105.5 FM and listen to traditional holiday music as you and your family take in the sights. Every holiday season, Sam’s Town Hotel and Casino transforms into a true North Pole experience with the Mystic Falls Park Winter Wonderland! Take a peek inside Santa’s workshop and watch busy elves make toys and load Santa’s sleigh or watch a thrilling holiday laser light show that features all your favorite classic holiday songs. You can also catch Santa donning his cowboy boots on Thursdays and Fridays from 4 p.m. – 8:30 p.m. and on weekends from noon to 8:30 p.m. 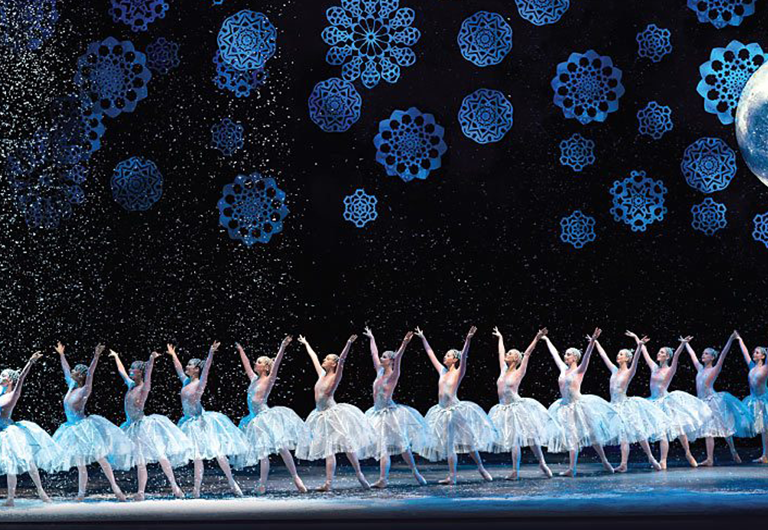 The Nevada Ballet Theatre at Reynolds Hall in the Smith Center will perform the classic holiday story, The Nutcracker, featuring beautifully choreographed dancing to the familiar musical spectacle. From the curtain rising to the final bows, you and your family will rejoice in the must-see holiday celebration. You’ll have several opportunities to begin your newest family tradition as The Nutcracker is performing from December 8th-24th. Being one of Vegas’ favorite charity organizations, the Magical Forest at Opportunity Village is a must when creating your holiday to-do list. Watch your children’s eyes light up with holiday cheer as you stroll through an enchanted forest lit up with thousands of lights, ride a Forest Express Passenger Train, experience a magical carousel, whisk down an inflatable avalanche slide, play mini-golf, ride a mini-coaster, and take photos with Santa, of course! You’ll also find food, nightly entertainment, and dozens of photo opportunities. The Magical Forest is one of the most entertaining holiday attractions for the whole family! Come see Santa as you’ve never seen him before – swimming with the fishes at Santa in the Shipwreck at Mandalay Bay Shark Reef Aquarium! Santa suits up and dives in with his sea life friends every weekend throughout December until the 24th. Only in wonderful Las Vegas can you see a scuba diving Santa Claus! Another great option to keep you and your family entertained during their Las Vegas holiday is the iconic Springs Preserve! There, you’ll find the Springs Preserve Holiday Express where you’ll climb aboard and be transported to Santa’s very own wintery village. Have your camera ready because you won’t want to miss capturing all the holiday merriment as you and your family create crafts together, decorate cookies, listen to storytelling, and see Santa during this magical holiday experience! This Christmas in Las Vegas, the Wizards of Winter will be coming to town on December 15th to rock your jingle bells while mixing classical music with progressive rock! Featuring former members of The Trans-Siberian Orchestra, Blue Oyster Cult, Alice Cooper band, and more, the Wizards of Winter is a true Christmas rock ‘n roll opera. Led by musical director, Scott Kelly, you and your family will watch in wonder as you experience a musical jammed-packed with violins, guitar solos, and synchronized light displays. This season, be sure to take advantage of all the festive events happening during the holidays in Las Vegas. From seeing twinkling lights to enjoying the annual showing of The Nutcracker to simply making hot cocoa and watching classic holiday films in your home, you and your family are sure to find ways to celebrate both old and new traditions. Whatever you choose, enjoy the special moments you create this Christmas in Las Vegas.